It seems that I have to write about David Crystal once a year or so. 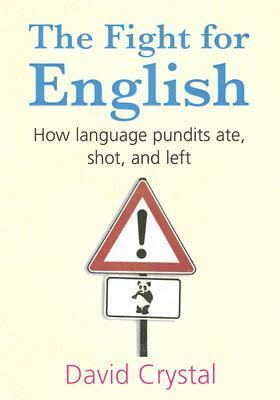 This expert popularizer of linguistics always provides well-informed but accessible antidotes to common myths about language, such as the one alluded to in the subtitle of his book The fight for English: How language pundits ate, shot, and left. What do I mean by “expert popularizer of linguistics”? First, Crystal is a professional linguist at the University of Wales who apparently knows everything about the English language. Second, some of his articles and books, including all of his best-known ones, are written not for his fellow academics but for the general public — or, should I say, the educated portion of the general public. Written with panache, The fight for English is primarily an argument against prescriptivism and other anti-scientific views of linguistics. Read this book, even if you’re a fan of Lynne Truss — actually especially if you’re a fan of Lynne Truss. You’ll gain an appreciation for a well-informed view of how language continually changes and what we should do about it.